I attempt to write/practice these….one per day. Yet I still freeze up and say it wrong when addressing a local. I keep trying. It is becoming easier daily to settle into my routine; a very gentle way of being. Today I woke to the sight of three volcanoes…..friends from last year. This is our first blue morning, the haze has lifted and there they are. 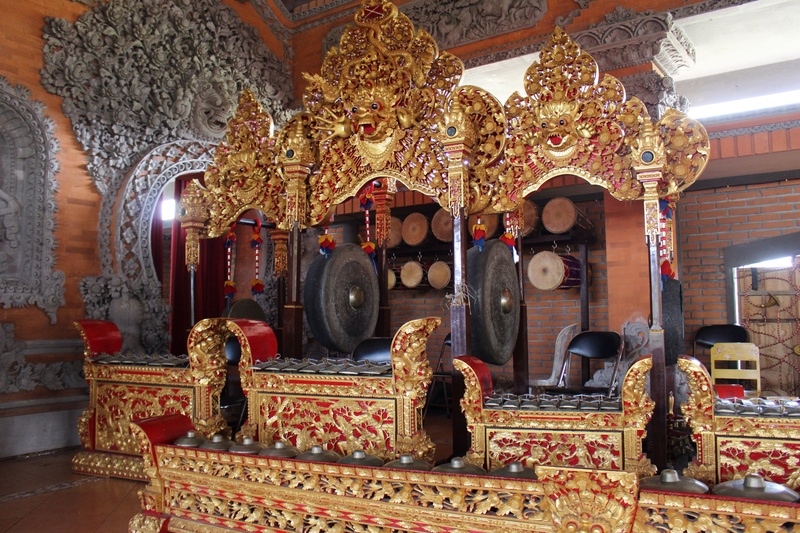 My host, Sumantra, plays in the community gamelan ensemble and Tues. eve he invited me to a performance at the nearby public hall. The gamelans accompanied dancers who recreate the Barong story. Even though I hadn’t a clue about the storyline, the spirit captured me and I created my own version which was, ultimately, not unlike the ancient story I read post-performance. Sumantra and Uluh’s daughter was home from school today so I was able to take her photo. She is Wayan. Each boy/girl is named according to birth order. 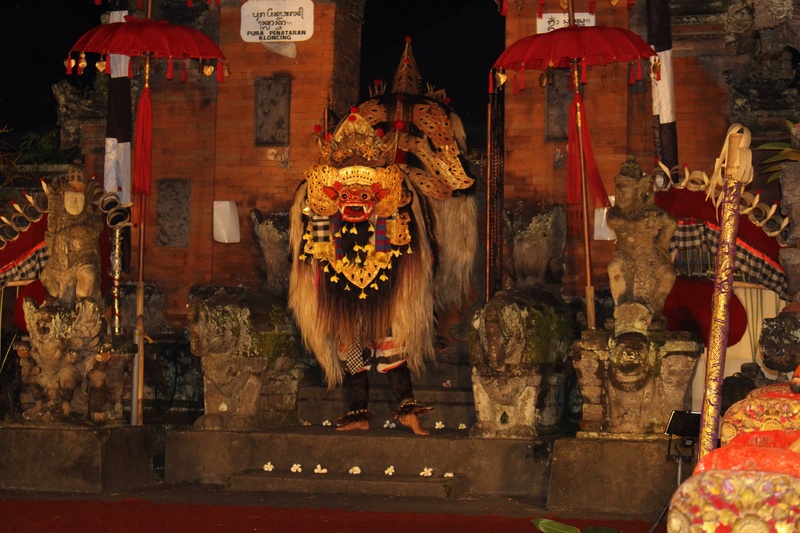 First, Wayan, then Made, Nyoman and Ketut. The fifth begins the order again. This can be very confusing if you’re not Balinese. They have additional ways to differentiate. 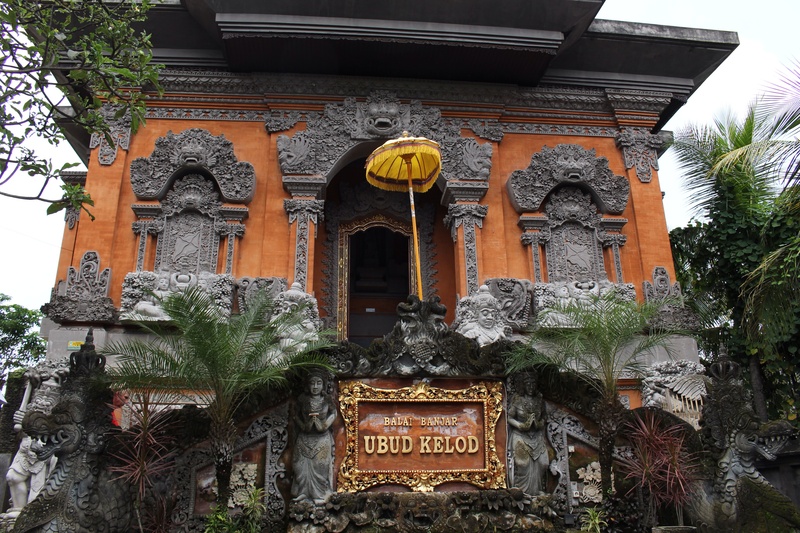 Tuesday was a “strolling-in-Ubud” day. Each day I observe something not seen the day before. I stopped at a performance hall nearby and was enthralled with the beauty and complexity of construction and space. These halls exist in every village and can be simple or very grand structures. 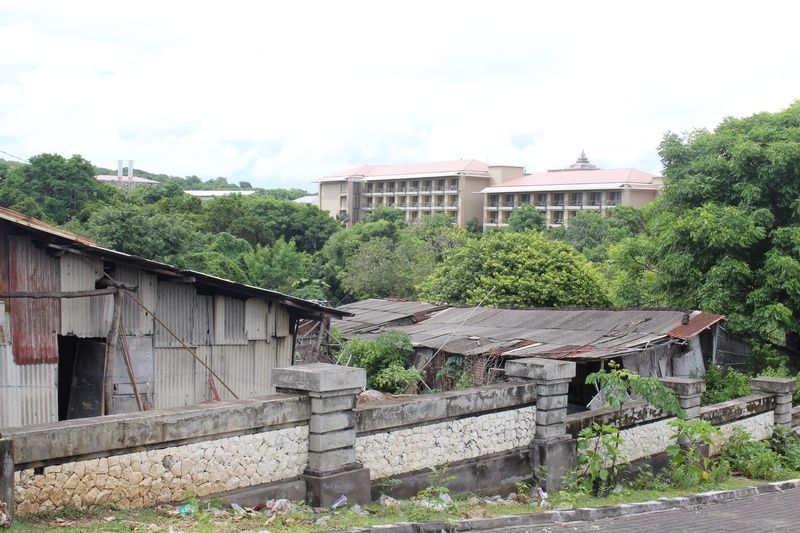 The buildings are open air and often nothing is locked up. Nothing disappears or is vandalized. The same is true for museums. They are quite grand and house impressive collections of art which are unguarded, not air conditioned nor protected by a bevy of rules. The grounds are exquisite, lush, colorful and well maintained. 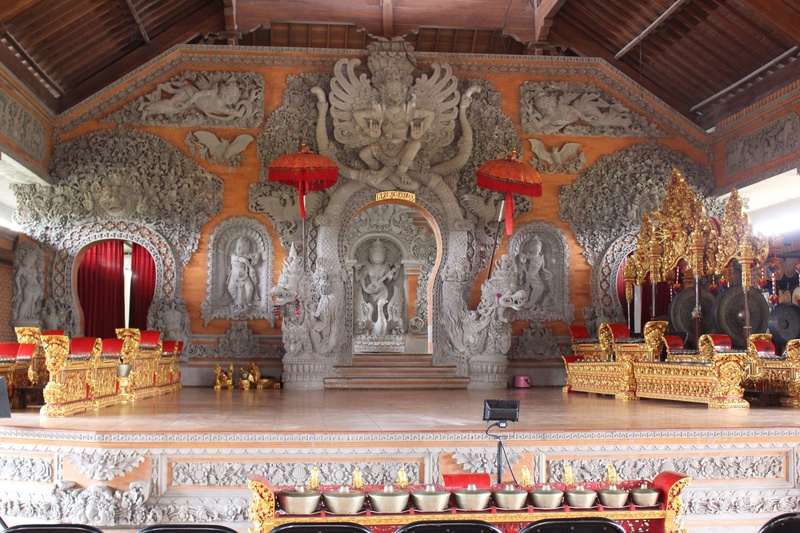 This day I went to Puri Lukisan which features pre and post war Balinese art. Such detail! The work makes my paintings look uncomplicated. Those of you who know my paintings know this is not true; however, perceptions change. Lunch was enjoyed at Tropical View Cafe which I saw being constructed on my visit last year. 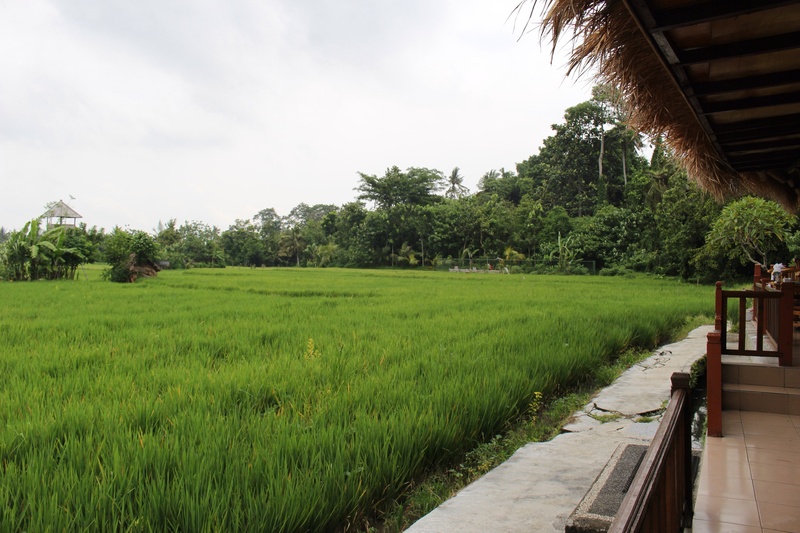 It sits on a hill next to the jungle and overlooks rice fields. It catches a magnificent breeze which was much appreciated in the heat of the day. 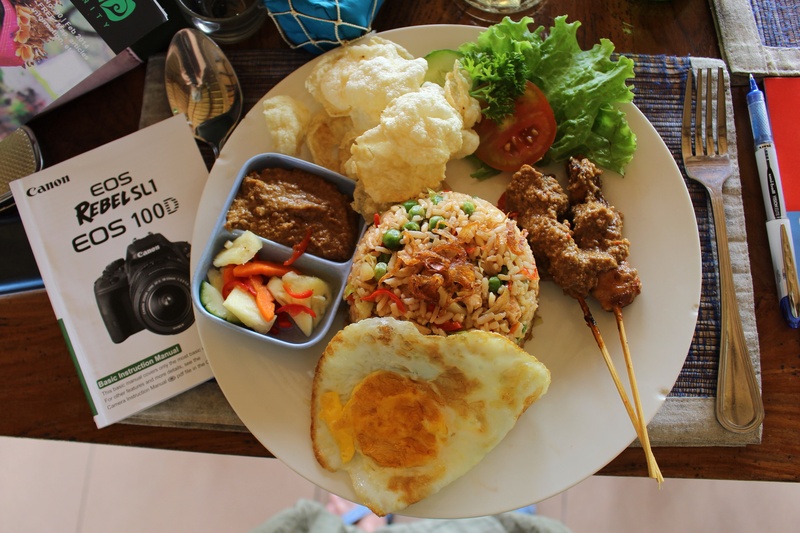 I enjoyed a good lunch, attempted to learn a few things about one of my new cameras (with great distraction) and visited at length with the Balinese server. She was excited to practice her English. Having English skills here increases both earning power and the possibility of elevating to a different caste. Yesterday was an 8-hr trip with Made (driver of last year) to the southern coastal areas of Bali. There was much I enjoyed (nature) and some I don’t need to experience again. I finished the day at a seaside restaurant, the Blue Marlin, in Jimbaran. I chose my fish from the tank (a red snapper) and my spices, then watched it thrown onto the grill. It was the best fish dinner I ever had. The challenging part of the day was seeing the tremendous wealth and mega beach resorts of Nasa Dua contrasting with the stark poverty just across the street. Such a dichotomy. As always, I returned from this outing exhausted…..sensory overload from sights, sounds and smells too numerous to assimilate. This is true for pretty much every day, no matter where I am although the traffic ups the adrenalin output considerably. Two lanes are utilized as four with mopeds, trucks, buses and cars doing the most amazing vehicular ballet you could imagine. Tidbits: My washing machine is a black bucket on the balcony; the dryer, a rack. I keep a yellow flower on top of the sink faucet (cold water only) to remind myself not to drink or mouth rinse. I wash my feet under a low faucet in the bathroom after a hot day of walking. I am thrilled to have remembered the 35-yr-old heater coil for Mei Gorang or EARLY morning coffee. Imagine fruit brought from the mountain farms to the market at 3 am, purchased by Iluh at 5:00 and placed attractively on my plate at 8:30. Sumantra was startled and amused to see me salt the watermelon slices! Paper products are at a premium – toilet paper being the most challenging to keep on hand. Correction: 1,250,000 rp per $100 bill.